Explore extraordinary landscapes of windswept glaciers and fjords, the high peaks of the Andes, and the driest desert in the world. A land between mountain and sea, that starts in the driest desert on Earth and ends in the gorgeous fjords of Patagonia, Chile is the top country to visit in 2018. 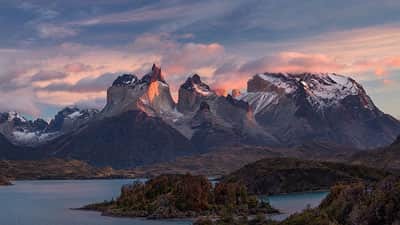 In Patagonia, visit the soaring mountains, bright blue icebergs and emerald forests of Torres del Paine National Park. The park gets its name from the three granite, horned shaped peaks towering above, Cuernos del Paine. Witness glaciers descending from the Patagonian Ice Field, hike snow-covered mountains and forested valleys or go kayaking in this remote natural reserve.